Ran the first train last night, it just went behind the furnace and over the bridge, that is all the track I have done. I did manage to finally get one turnout done, I will post some photos soon. I need some opinions, what do you think of the rail color on the sides of the rails? 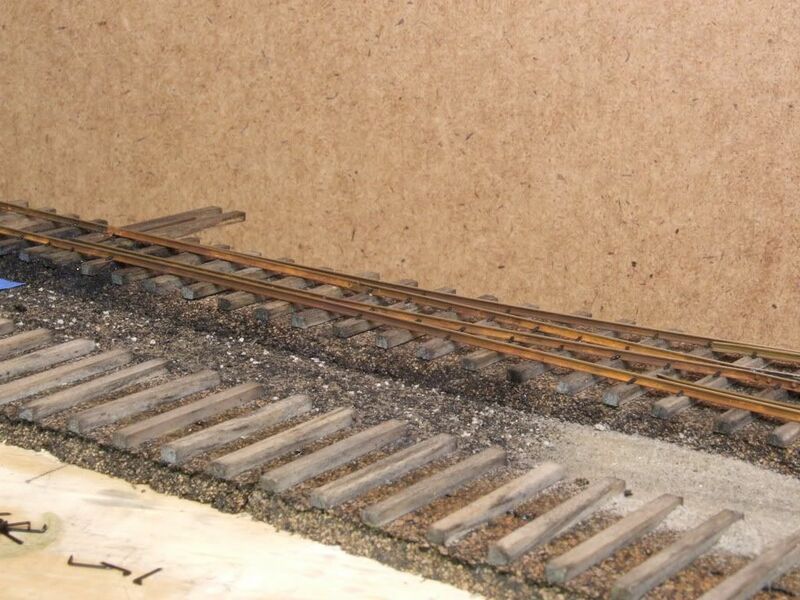 I am rusting each rail before I install them on the layout. I painted the rails a rust color and while the paint was still wet I applied Bragdon weathering powerder using the three rust colors, black, and some dusty sand color. It is very time consuming but before I go any further I need to know what you guys think, is it worth it? Also, I am adding extra details to each turnout since I only have a small amount of them. I am adding bolts to the sides of the frogs and building scale throwbars. I really love your trackwork, Jeff. To me the color is perfect. Wow, this track looks incredible, it's very lifelike, looks like the real thing. Excellent finish and detail on the rails ... as long as it will hold up to ballast application and cleaning. I have noticed that the color of the rail is as much an indicator of traffic density as the crossties and ballast. It may also be affected by locomotive types, places where locomotives tend to idle for long periods of time, etc. I guess I�m going to be a contrarian on the color (the track work is great). I think the rust should be darker. Light rust means new rust. The prototype track I�ve seen is darker. I agree with George, all the rail I've seen has been a darker gray/brown color. I like the idea of the pre-rusting stage, and it does add very well to the feel of the trackwork. After actually taking the time to look at a few prototype shots, I think I have to agree with the other comments, that the colour maybe has too much rust appeal, and should be more of a darker rust with a higher value of grime over the top. Aside from the colour isse, great thinking and execution. The frog details are really nice as well. I was thinking it looked a little to orange myself, but from the photos I have been looking at it could be good. Rust is one of those things that is really hard to say it is right or wrong. I did a search online of the East Broad Top and you can see in the photos that the color ranges from orange to that dark rust and gray. here is a good example of rails of different colors, from the grayish black to bright rust, do you think the bright rust rails are newer? I think that I may continue the way I am for a little bit and then do some dirt / ballast work to see, as Mark stated, if it holds up the scenery work. I am hoping that the color holds but we all know how weathering powder can react when sprayed, I think mine will hold up because it is actually stippled into wet paint and the color is actually the mix of the paint and the powder and the texture is from the stippling. At the moment I am going to have a little trouble getting some soil for the text as any dirt around my home is frozen and under a blanket of snow. I may be able to find a construction site and get a chunk of frozen dirt to bake in the oven. I got another turnout finished over the weekend, I have about five hours into each so it takes me a while but I am hoping that by Christmas I will be running around the loop. 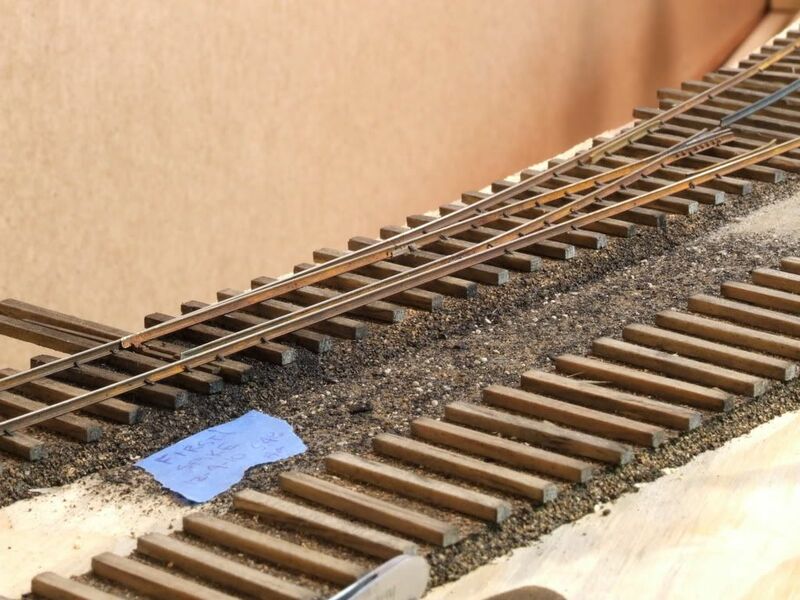 I only have two more to do of visible track, after that I will have three that will be in staging and I will do them more the traditional way and they should go much faster. Excellent track work. it looks very realistic. Is it difficult to hand lay track? I have never built a layout yet would it be an unwise choice to try and hand hand lay track for my first layout or should I just use commercial track? That would depend on if you are naturally good at building things or not. If you can build a model you can build track, as long as you understand the function of each part of the track. Fasttracks has very nice accurate turnout templates that you can download, build a turnout over one of them and you pretty much have it. Of course you should make sure you understand and are good a soldering. 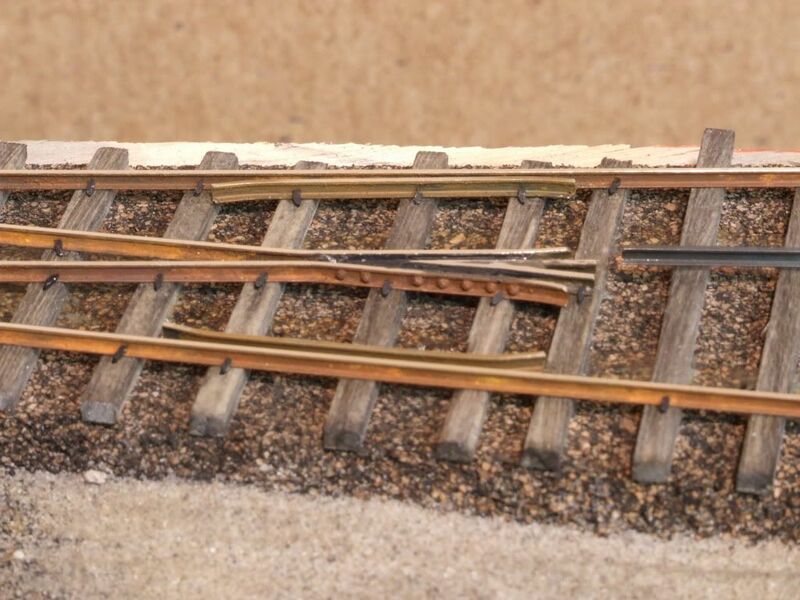 My biggest mistake I made when I built my first turnouts is that I did not understand how to use every part of the NMRA gauge, I only made sure the rails were to correct space apart, which is only one part of the turnout. It is important to know how to check the back space at the turnout points and at the frog / guard rail area. I would give it a try if it is a part of the hobby you think you might be interested in. It is a great skill to learn because you can get nice flowing trackwork. It is also much cheaper to build turnouts than to buy them. Get a piece of rail, an NMRA gauge, print out a Fasttrack template, get some spikes, a soldering iron, am 8-12" file, and some rail cutters and try one out. You can build it on a piece of Homasote and not even use ties, if it works out you can unspike it and install in on the layout, that is what I am doing now. I have built turnouts in place but this time I am trying to detail them at the bench first. Here�s a link to a series of videos on hand laying turnouts. He�s working in N scale, but the same techniques are used in HO or On30. If you don�t like watching someone doing repetitive soldering, you can fast forward through some of the videos to save time.